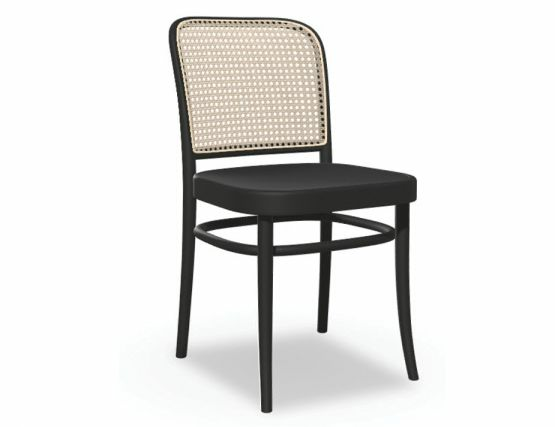 TON's Thonet Hoffmann 811 dining chair is based on Josef Hoffman's design from 1930, combines his interest in Art Nouveau and simple shapes with technology which has been used in Bystrice pod Hostynem for over 150 years. The 811 chair, regardless of age, feels fresh and modern yet still adheres to all of the elements of style that have made bentwood furniture so lasting and so sought after. About TON. In 1861, a bent furniture plant was opened in Bystrice pod Hostýnem and today it is among the oldest in the world. It was no coincidence that its founder Michael Thonet, whose name the plant bore, chose this place. Surrounded by beech forests offering enough material for the manufacturing process, Bystrice pod Hostýnem also saved on transportation and labour costs thanks to its location. Very unusual industrial labour organisation system, where the workers were specialised in only one task, and also use of unique technologies were other factors that helped the chairs from BystÅ™ice compete at a reasonable price and expand all over the world.